This morning I started building the Brendon phone transceiver. I've already mounted the front panel with all the controls and started to add parts to the main PCB. The instructions are easy to follow. 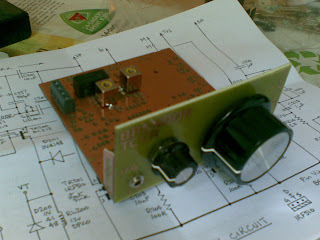 I have also ordered a linear amplifier kit from Tim Walford to upgrade the rig. Later I might try to modify it to work on 40m with a 7.159MHz crystal from the G-QRP club shop. I'm aware that the tuning range will be very narrow with this mod.